The Mintlaw Boys Club donation made a journey of more than 7,500 miles to Malawi to help school pupils whose own tops, shorts and socks had been swiped. The sky blue strips have now been handed out to the youths at St Anthony Community School. They come with the Mintlaw Boys Club logo on the front of the tops along with the name of the local team sponsors, the Saplinbrae Hotel. Vicky Henderson, from Mintlaw Boys Club, said one of her colleagues at work was heading out to Africa and was keen to hand over the gift. Mrs Henderson said the strips were found in one of the team storage units and it was agreed that youths in Africa would benefit from them. The mother, whose young son plays with Mintlaw, said: “I’ve got a colleague who goes out there to work at a hospital. “I asked if she would like a set of strips and she took them to a school. 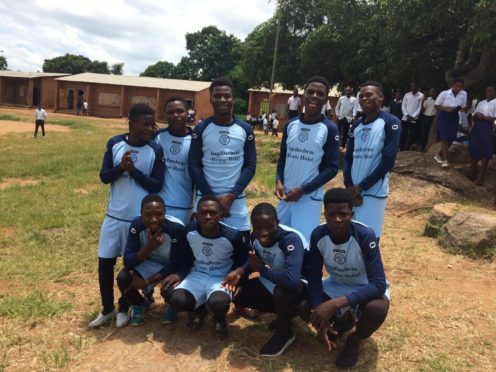 Football kits have also been sent out to a team in Kenya and it’s hoped that more donations can be gifted to youths in Africa over the coming months. Mrs Henderson said the local club recognised how fortunate the youths were being able to play the sport fully kitted out in Mintlaw. She said: “Our kids are quite lucky because we’ve got Mintlaw Boys Club and we’ve got AstroTurf to train on. “These kids in Africa aren’t so lucky and don’t have the luxury of sponsors and facilities.